The Master of Science in Communication Sciences and Disorders program in speech-language pathology at Chapman University is accredited by the Council on Academic Accreditation in Audiology and Speech-Language Pathology of the American Speech-Language-Hearing Association, 2200 Research Boulevard, #310, Rockville, MD 20850, (800) 498-2071 or (301) 296-5700. 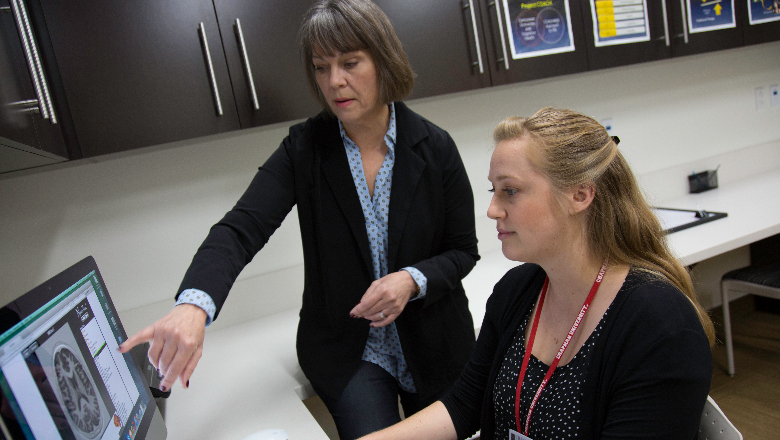 The Department of Communication Sciences and Disorders (CSD) prepares students to become fully credentialed and licensed speech-language pathologists, clinicians and/or supervisors in healthcare and education settings. This full-time, intensive program is a rich combination of didactic and clinical/fieldwork courses providing carefully guided internships each semester. Placements include hospitals, skilled nursing facilities, private practice, agencies, early intervention programs, and K-12 public schools. Students have both on-site supervisors and university supervisors assigned for each setting. 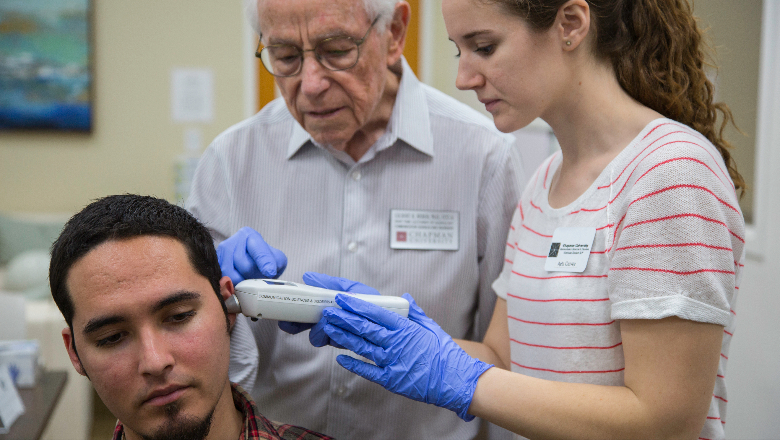 Completion of the requirements for the MS degree and passing scores on required tests, allows graduates to be recommended for the Preliminary California State Credential in Speech-Language Pathology. Counsel and support individuals, their spouses, family members, siblings, educators and other professionals on the use of hearing aids, assistive listening devices, cochlear implants, augmentative and alternative communication systems, and other technology to communicate effectively. A 62-unit program designed to be completed in two years (including summer terms), which includes a total of 11 units of practicum. School-Based Setting Emphasis: The school-based setting emphasis prepares candidates to assess and treat preschool through high school students with communication disabilities that adversely affect their academic success. Students will become familiar with federal and state laws, family counseling, evidence-based practice in articulation and language disorders, autism spectrum disorders, language/literacy delays, attention deficit disorders and augmentative and alternative communication. Medically Related Conditions Emphasis: The medically-related conditions emphasis focuses on the conditions of voice disorder, neuro-physiological syndromes, dysphagia (swallowing), and stroke rehabilitation, and any injury or illness that results in speech language impairment. Speech-language pathologists work in hospitals, rehabilitation centers, community clinics and private practice. To combine the two emphasis areas, special clinical training sessions are incorporated into the program each year at no additional cost, e.g. Scottish Rite Childhood Language Center, Illumination Foundation, Head Injury Program at Coastline Community College, AAC Camp, Stroke Survivor Boot Camp, Communication Recovery Group, Literacy for Homeless Students, Feeding for At Risk Infants, Preschool Speech and Language Screenings, Special Olympics Healthy Hearing Screening, Cleft Palate Panel, Sunrise Assisted Living Center Meal and Hearing Aid Programs, Weekend Fluency Sessions, Brain Injury Treatment Program, and more. The entire application process for Chapman University’s M.S Communication Sciences and Disorders is completed through the Communication Sciences and Disorders Centralized Application System (CSDCAS). Deadline to submit your application to CSDCAS: January 15, 2019 at 11:59 pm Eastern Standard Time. The admissions committee only reviews applications that are submitted and verified. This means that all items required (see below) has been submitted and verified by CSDCAS. The verification process turnaround time increases during the months of December – February. Please turn everything in early to avoid any delays in the application reviewing process. An Undergraduate degree in Communication Sciences and Disorders or the Post Baccalaureate (leveling courses) equivalent is required for this program. Undergraduate degrees, minors or leveling courses completed outside of the United States will not be accepted. Applicants who wish to inquire about or appeal an admission decision may contact the CSD admissions specialist in writing at csdadmissions@chapman.edu. If the student wishes to submit a formal written appeal, the admissions specialist must receive it within 10 days of the admissions decision. The written appeal will then be forwarded to the Program Director, who will review the applicant’s documentation, discuss it with the admission committee (if deemed necessary) and respond in writing to the applicant. If the applicant wishes to further appeal the response they may do so in writing to csdadmissions@chapman.edu within 10 days of CSD program director’s response to the initial appeal. At this point, meeting will be arranged with the applicant to review their application package and review scores and to discuss the program’s decision. If the program decides not to admit the student, the applicant may submit a written appeal to the Dean of Crean College of Health and Behavioral Sciences within 5 working days of notification of the program’s decision. The Dean will confer with the applicant and meet with the program director and admissions committee, if appropriate. Within 10 business days of meeting with the Dean, the applicant will receive a formal written statement indicating the decision of the college. The Dean’s decision is final. The American Speech Language Hearing Association (ASHA) 2014 SLP Certification requirements must be completed in order to receive your Certificate of Clinical Competence (CCC’s). You do not need to complete these courses to be accepted into the program. However, we highly recommend completing these courses before you finish the program. For more detailed information and a list of all the acceptable courses please visit the ASHA website. Our students and faculty are very much involved with the community, scholarship, leadership and legislative advocacy. The CSD Board of Counselors is both an advisory board and a student and faculty support organization comprised of community members and professionals with a deep interest and commitment to the field, and specifically this CSD Program at Chapman University. Members meet twice a year with the Program Director and the Dean to discuss important activities and needs within the program, and hear directly from graduate students and alumni. Gilbert R. Herer, Ph.D. CCC-A/SLP - Audiologist, Professor Emeritis, George Washington University, Washington DC. The National Student Speech Language Hearing Association (NSSLHA) is a pre-professional membership association that consists of graduate and undergraduate students involved in the field of Communication Sciences and Disorders. It is the only national student organization in the field that is recognized by the American Speech Language Hearing Association (ASHA). NSSLHA helps raise awareness about the profession of speech-language pathology, and promotes the awareness of speech and/or language disorders. The members of NSSLHA engage in a variety of community service and volunteering opportunities in the local community and the greater Los Angeles area, such as the Relay for Life, MS Walk, Autism Walk, Surfer Healing, Down Syndrome Organization, BRAIN, and the Special Olympics. The organization collects dues, elects officers, raises funds, and provides leadership opportunities within Region 10 in the US. The CU student chapter has been awarded National Gold Status for the last 3 years. Visit Chapman's NSSLHA website to learn more about NSSLHA as well as the students and recent events. For information on financial aid, current year tuition and more, please visit the pages below! Under the leadership of our Executive Director Judy Montgomery, PhD. 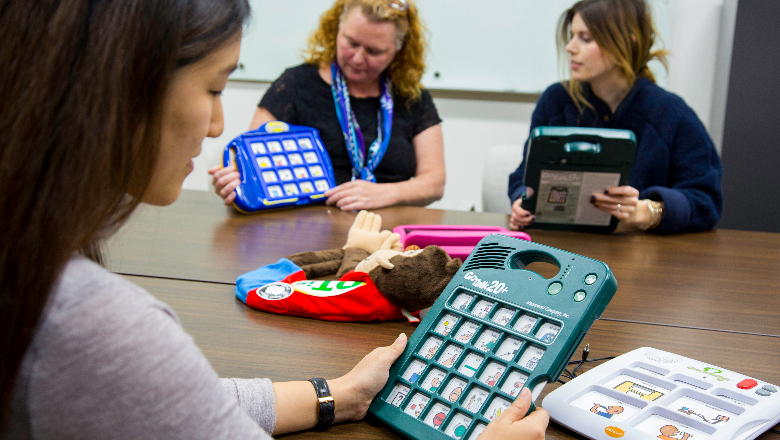 CCC-SLP, Chapman students provide no-cost assessment and treatment of children with speech and language disorders in Orange County. The Adult Learning Lab is an environment in which graduate student clinicians and faculty supervisors learn side by side. Graduate student clinicians provide diagnostic and intervention services to adults while receiving personalized supervision by faculty. The lab is available each trimester for adults with acquired cognitive communication disorders.